Bloggers and Tweeters are roasting Zuck in droves, and mainstream media has joined the pile. 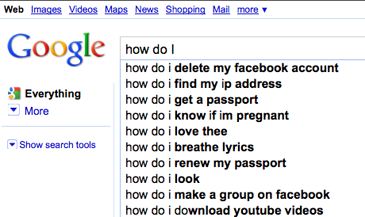 The number one “How do I” search on Google is “how do I delete my Facebook account?” But really, what’s the big deal? Privacy is already dead. Let me just say that I agree with those who say Facebook should make privacy allowances an opt-in, not a ridiculously complicated opt-out buried deep inside the site. •	launched what can only be accurately described as a communication revolution that’s really still in its infant stage. people who want to engage in social shopping would have the most robust tool ever invented. Just by clicking on the new “Like” button, share as much information about what they buy, where they visit and what they enjoy, they could share a remarkable amount of information with friends. People want to share what they are doing, buying, saying. That’s why social shopping sites, Twitter, texting, and every other social tool, including Facebook, are growing so exponentially. ethical marketers could create new privacy policies that let consumers choose whether they want to be dynamically fed discounts, coupons, special events and news relevant to their purchases or searches on the site. If, instead of pursuing that misguided path with Open Graph, he’d announced the features of Facebook’s new API; explained how they actually could make the web an even more interesting and collaborative experience (more on that later) and made trying the new tools an invite-only option, he might have had an entirely different response. Instead, he overplayed his hand, and now he’s the one who’s under scrutiny by everyone from Congress to Hollywood to blogs and mainstream media. After all, turnaround is fair play, but I’m sure Zuck’s squirming under the pressure. Privacy has been dead for a long time. While heaping blame on Facebook is now in vogue, and it’s funny when Jason Calacanis talks about getting Zucked, consider the information your credit card company, Amazon, Google, Yahoo, and any site you visit regularly already has about you. It was dead before the Internet came along. Consider what information about you is already public. Ever make a copy of a private document on a digital copier at the library or Kinko’s? You ain’t got no privacy baby! Facebook is just the latest focus. People have made a lot of terrible decisions about what they put online for as long as the Internet has existed. It’s about time everyone realized that you shouldn’t put anything online that you wouldn’t want an employer, the government, or your mother to see. Facebook never made those decisions for anyone! Nonetheless, Facebook is paying for their bad decisions about Open Graph. They’ll have to hire a big deal PR firm to help them fix their damaged reputation and Zuck will have to tone down his spiel. The privacy settings on Facebook will be moved to “opt in” and they’ll have to make them clear and easy to find. That’s housekeeping. Sooner rather than later, there’ll be an IPO valued on your privacy data. It seems inevitable. Last week, Zuck hired (R) Tim Munis, former Bush-era FTC chair to handle privacy issues. Clearly, he’s got to start playing nice in the sandbox. The Hollywood movie will ridicule Zuck and make people take him less seriously. But then again, like anyone who’s lost a job when an employer found a racy shot of them on Facebook, Zuck should have been thinking about his reputation and his privacy back when he said and did the things that the film will feature. You’ll get a Diaspora “seed,” a personal web server that stores all of your information and shares it only in ways, and with those you choose, giving you full control of your online identity. “Diaspora knows how to securely share (using GPG) your pictures, videos, and more. When you have a Diaspora seed of your own, you own your social graph, you have access to your information however you want, whenever you want…Once we have built a solid foundation, we will make Diaspora easy to extend to facilitate any type of communication, and the possibilities will be endless. Man up – it’s not all Facebook’s fault. Some people think the rich will eventually find a way to pay to keep their data private through yet to be created privacy services. But it seems too late for that for most of us – rich or poor. People want to choose who sees the information they share. That’s the concept at the heart of social networks. Facebook broke the rules by making the decision opt out instead of opt in. But there’s no going back. Almost every one of us has already over-shared private information – from our real birth date to our mother’s maiden name entered as the answer to a security question on a website. Don’t blame Facebook. We gave up our privacy without help from Zuck. He’s just the latest chapter. B.L., Comprehensive post! I disagree on the point of privacy being dead. Certainly, privacy is “limited” depending on how you CHOOSE to engage. The biggest difference with all the other services you mentioned is we have a choice about what is shared. There is a world of difference between opt-in and opt-out. If “trust” is supposed to be the currency of those engaging in social media, shouldn’t it be for social networking platforms themselves? Diaspora’s success in raising money on an idea alone is a sign that the market is poised for change. Thanks the common sense explanation. I know once something is on the internet it’s “out there” for anyone who takes the time to look for it. But with the facebook thing, I don’t mind people seeing everything but I have different areas of friends and family. Some are previous co-workers I don’t want to lose touch with but I don’t want to bombard them with the drivel I might share with family members. That’s why I’d prefer to opt-in and then chose my level of sharing with each post. I’ve signed up to stay informed with Diaspora. Thanks! PS. I’m going to share this link with all my facebook friends. Right on the money as always, my dear BL. I just can’t concur with this part: “consider the information your credit card company, Amazon, Google, Yahoo, and any site you visit regularly already has about you”. – If Amazon breaks my trust it costs them lots of money. My CC Co too. The nature of the business relationships one has with those companies makes toying with terms and conditions expensive, so they don’t -usually- do it. – Re Diaspora: I saw a tweet (@badbanana or @borowitzreport I guess) yesterday: The solution to FB privacy f’ups: let’s surrender all our data to four students! oh, wait. Unfortunately, most of us don’t read the small print on credit card contracts, or any other contracts for that matter. And even your utility company, your landlord, your magazine subs have all sold your data based on some flimsy excuse of permission. Very funny about mr banana and andy borowitz! and i guess they have a point. The problem i see with Facebook is that Zuck didn’t ask. That’s an asshat move, and he’ll back down as he did with his other overly ballsy infractions. But the writing is on the wall, and I agree that the desire for privacy is largely generational and that it really is not the norm.